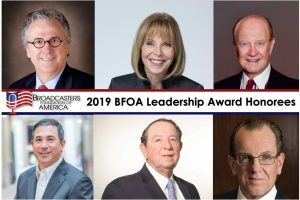 The Broadcasters Foundation of America, the charity devoted exclusively to helping broadcasters in acute need, is proud to announce the recipients of the 2019 Leadership Awards. The Awards will be presented at the Broadcasters Foundation annual breakfast at 7:00AM, Wednesday, April 10 in the Brahms Room of the Encore Hotel in Las Vegas, during the National Association of Broadcasters (NAB) Show. Bobby Caldwell, Owner & CEO, East Arkansas Broadcasters, Inc.
Richard A. Foreman, President, Richard A. Foreman Associates, Inc. The Leadership Awards are given annually by the Broadcasters Foundation in recognition of career contributions to the broadcast industry and the community at-large. The breakfast is complimentary to all in broadcasting, although pre-registration is required. To register via phone or email, and to obtain information on reserving a page in the Program Guide, please contact the Broadcasters Foundation at 212-373-8250 or info@thebfoa.org.